Water can be a pricey and damaging type of loss and is typically thought to be the “most common” type of residential and commercial water damage. Your home appliances such as water heaters, dishwashers, machine washers and toilets can overflow, back up, or completely stop working and the consequences of the overflow of water to the living and work areas can seem unrepairable. 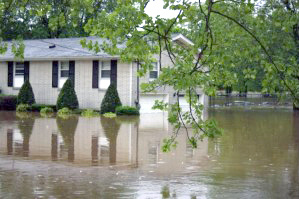 Sewer backups and broken pipes can also generate extensive problems with water damage, especially with a basement flood. Your local Glenview Illinois team is experienced and highly knowledgable in the extraction and removal of excess water. They put your mind at ease when they take are of all of your water damage clean up and water remediation needs completely and also handle any sewage damage repair and cleanup needs fully to conquer the dangers of microbial contamination. The art of dehumidification is backed by science. Location, placement and timing is the key–the faster we are contacted, the quicker we are able to begin our services of extraction and dehumidification. Glenview’s team will strategically place and frequently move the fans and dehumidifiers as the drying takes place. Over the period of a few days or more, we will visit your home or office and inspect our equipment to ensure maximum abetment and moisture removal, saving time and money on costly replacement projects. And will be applied to all affected areas of the home or business, depending on the damage including the basement, or crawl space. With our extensive knowledge in water damage restoration in Glenview Illinois, we can eliminate and prevent the growth of mold damage and get rid of offensive odors.